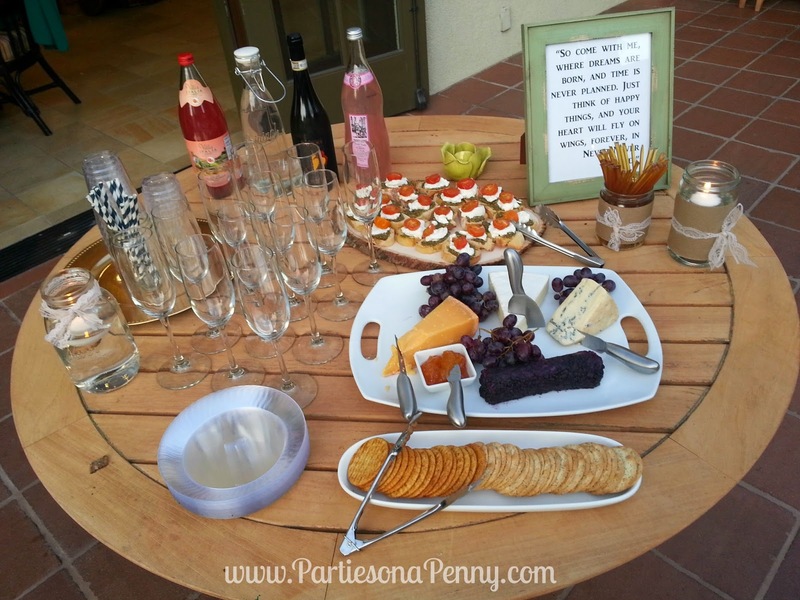 A couple weeks ago, I hosted a dinner party for one of my dear friend's birthday. 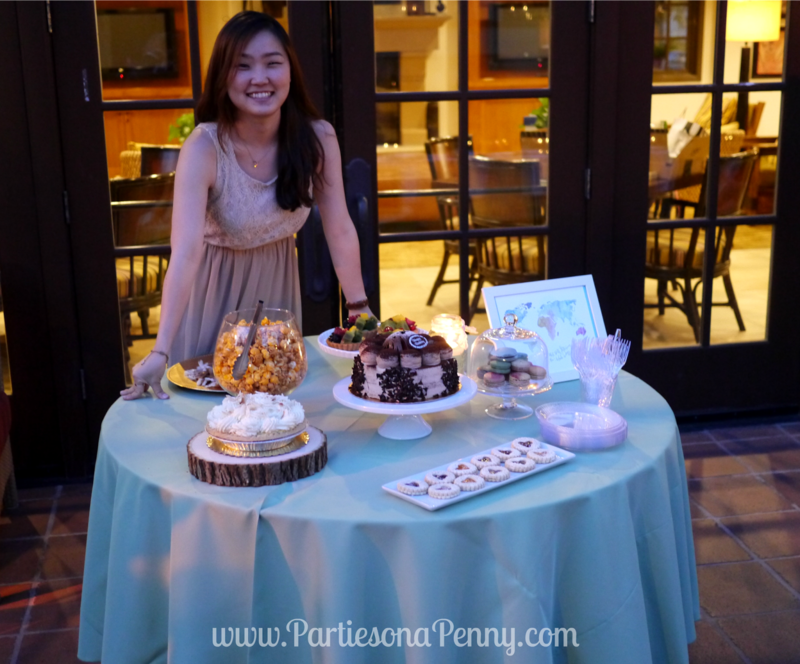 At her request, the party was a Neverland theme with an outdoor romantic style picnic. 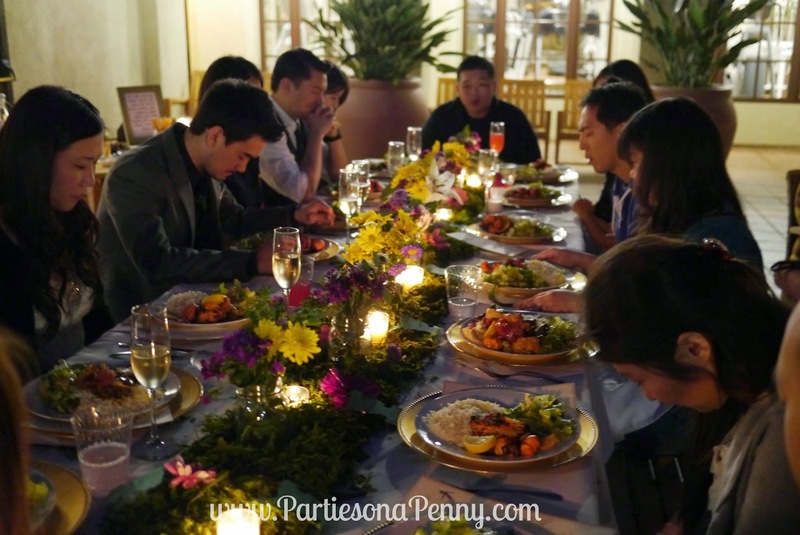 We centered the party around lots of candles, flowers/moss and lots of good eats and drinks. I absolutely loved how this party turned out! 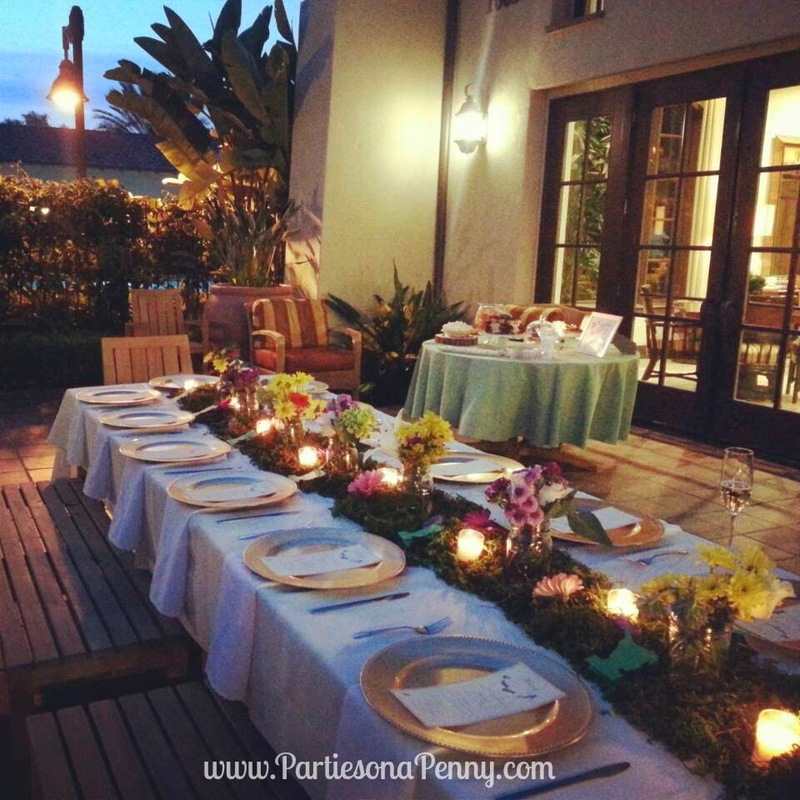 Here are some snapshots and details on the set up of Grace's Neverland Dinner Party. 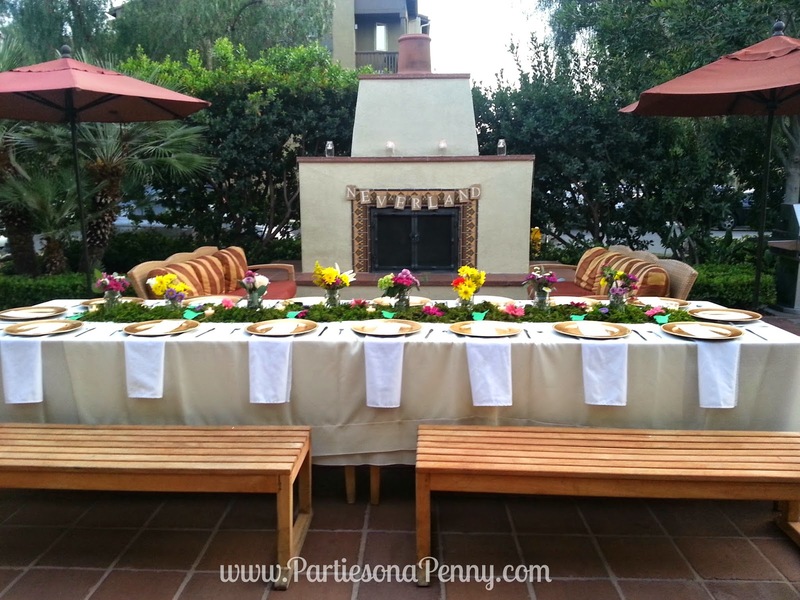 The setting for the party was held at an outdoor patio. 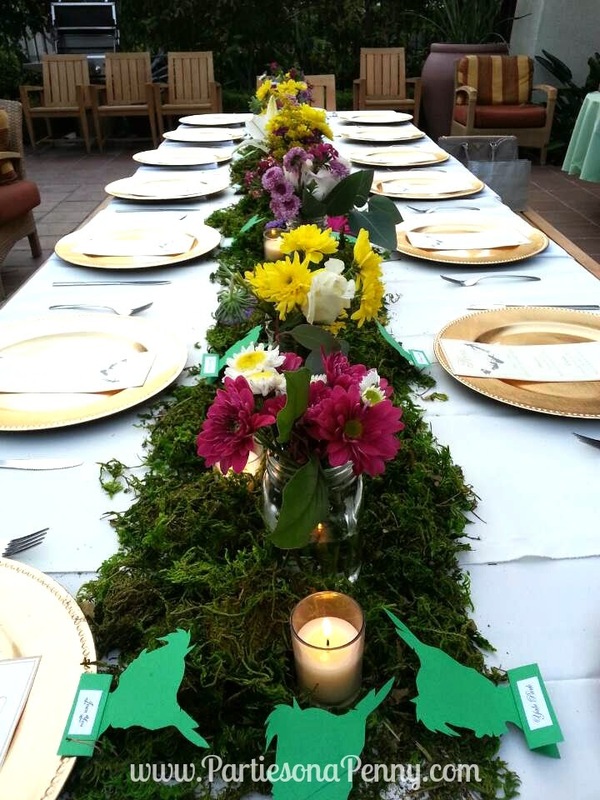 The birthday girl requested to have a romantic outdoor dinner party that was reminiscent of a forest. Since dinner was going to be a full meal, we went light on the appetizers with a cheese and cracker display as well as burrata cheese and pesto crostini. For drinks, we served an array of drinks such as blood orange soda, champagne and pink lemonade. 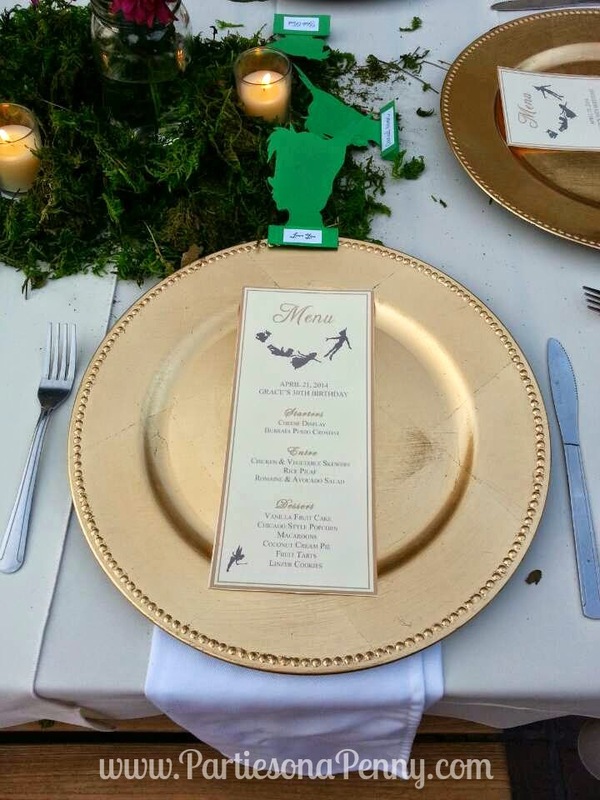 To add an elegant touch to the theme, we created Neverland themed place cards and menus accented with gold chargers ($8 for 6 chargers from Bed Bath and Beyond). To bring in the nature feel, I bunched together moss to use as a table runner (*Note-moss has a very strong earthy smell). You can easily find large packages of moss at Michaels for about $4. I also added several mason jars filled with colorful flowers as well as several lit votive candles among the moss. The birthday girl with her dessert table of all her favorite sweets: coconut cream pie, linzer cookies, macarons, cheese and caramel popcorn, salted caramels, fruit tarts and of course cake! In the night, the setting looked very romantic and intimate especially with all the lit candles. Parties are usually always fun whether designed or done in anyway, but giving such sort of a look is actually really fun to see and enjoy.